When Life Gives You Demons is Jennifer Honeybourn’s second novel with Swoon Reads. I read and enjoyed her debut novel, Wesley James Ruined My Life, last year so I was excited to read her next book. What I wasn’t expecting was it to be a paranormal novel about exorcising demons, which may sound scary but Jennifer pulls it off in such a fun way! Shelby Black isn’t like other high school students—she’s in training to become an exorcist like her great uncle and mother. Speaking of mother, Shelby hasn’t seen her in months after they had a major fight and she took off to a secret exorcist school in Italy. However, after Shelby unearths a hidden file in Uncle Roy’s cabinets, she realizes that her mother’s disappearance is not what she thinks it is. Now she’s on a mission to save her. That and of course trying to pass geometry with the help of the cute new boy, Spencer. When Life Gives You Demons is such a wild ride. I absolutely loved how fun the story was and Shelby’s lively point of view. Seems strange that the topic of demons and exorcisms would be described as fun, but honestly, it’s approached in such a way that the story remains light and even hilarious at certain moments. One neat relationship in the book is between Shelby and her great-uncle. It’s not often that I read a YA heroine having close relationships with members in her extended family, let alone a great-uncle! I loved this different relationship and how she tried to take care of him by making him eat healthy foods (and how he trained her in the proper ways in exorcising demons). The novel is on the short side, and it would have been nice if it was a little longer so we could have more about Spencer (the love interest) and Vanessa (her best friend). 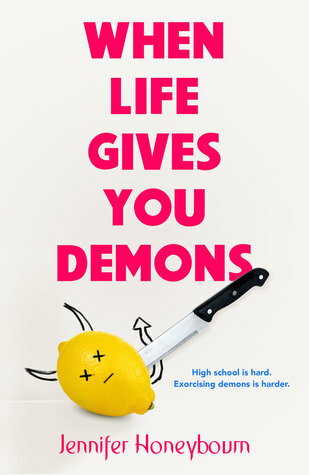 Overall, When Life Gives You Demons is a quick and fun read—perfect for the summer! I’m excited to see what Jennifer Honeybourn has planned for her next novel! Jennifer Honeybourn works in corporate communications in Vancouver, British Columbia. She’s a fan of British accents, Broadway musicals, and epic, happily-ever-after love stories. If she could have dinner with anyone, dead or alive, she’d have high tea with Walt Disney, JK Rowling, and her nana. She lives with her husband, daughter, and cat in a house filled with books. Wesley James Ruined My Life is her first novel. This is one of my most anticipated books of 2018! Adore the fun cover. The cover is so fun! I love the little demon lemon and the hot pink letters! Great review! I’m definitely curious about this book. Thanks, Kristi! It’s such a fun read! I hope you get the chance to check it out soon! It’s so fun! You’ll definitely love it! Thank you! It definitely is perfect for the summer!